You chose SugarCRM for a lot of reasons. Extreme flexibility. Ease of customization. Great return on investment. Imagine a sales person has an opportunity for a customer in Brazil and your organization's base currency is Euros. The opportunity was identified on May 25th for 10,000 BRL. With negotiations and specification engineering the sales cycle took three months. On May 25 the EUR-BRL exchange rate was 4.259084 so the 10,000 BRL converted to 2347.92 EUR. However, on August 25 when the deal was closed the EUR-BRL exchange rate was 4.775611 and was worth 2093.97 EUR. If your organization deals with more than one currency this situation is not unfamiliar. While dealing with exchange rates is unavoidable giving your users visibility into currency fluctuations can help them greatly. Currency Controller helps solve all of these problems and more. We access the same API that some of the largest companies in the world and over 200,000 other users use to keep their currency data up to date. Conversion rate updates are available at least every 10 minutes so your data is as accurate as possible. Every version of Currency Controller has a component that reaches out to and grabs the most recent conversion rates based on whichever default currency is set for your CRM. As frequently as every 10 minutes conversion rates for over 160 currencies (including Bitcoin, Silver, and Gold) are pulled and all Active currencies in your CRM are updated. We also insert any new currencies not identified in your CRM already and set to an Inactive status so your list will always be up to date. View historical currency conversions for any record in your CRM. 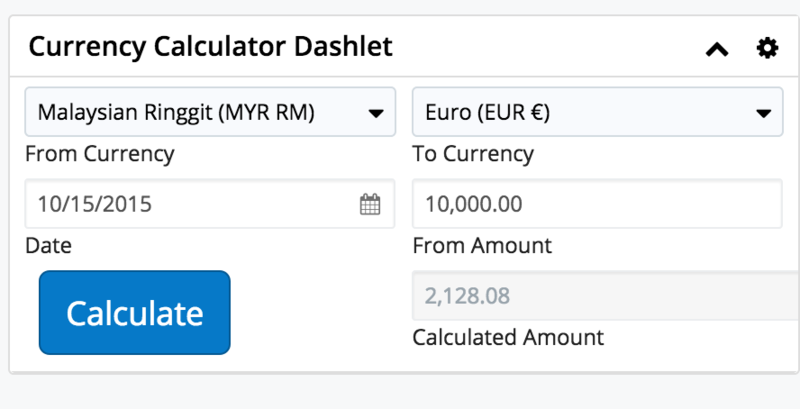 With the Currency Controller Complete Package any default or custom module can have a record view dashlet to show conversion for all currency fields. Current system conversions are loaded by default but you can also view historical conversions going back nearly 20 years. Want to see what the conversion was when the Opportunity was created? Simply select the create date and conversions to as many currencies as you like are displayed. There are options to hide curreny fields you would prefer not displayed and show or hide as many active currencies as you would like. Currency Controller for SugarCRM includes a convenient currency calculator that allows users to convert any value from any currency to any currency. Should the need or curiosity arise you can also see what the conversion would have been on any date since 2000. What about currency conversions within records? Currency Converter updates the currency conversion rates in the Currencies module of SugarCRM. Some default SugarCRM modules also have a default in field that is stores the system default currency conversion right on the record. As an example the Opportunities module has an Amount field and a corresponding Amount (USD) field which upon save converts the Amount value to the system default currency. 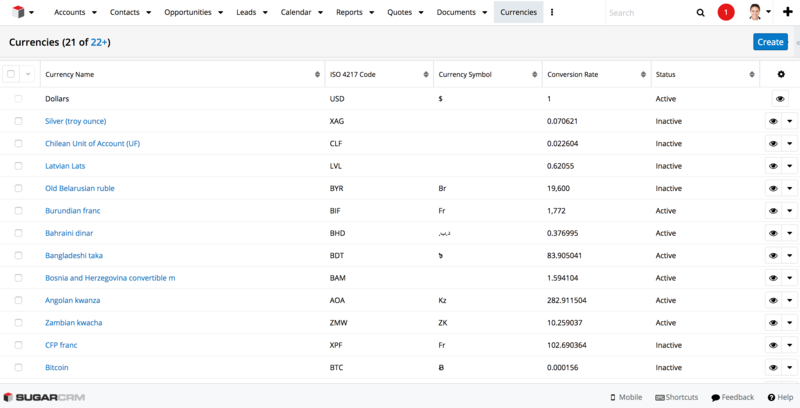 Many organizations that deal with multiple currencies want to report on their default currency so they have customized additional fields with similar functionality for other currency type fields so they can report on all records in their default currency. Currency Controller does NOT update any records other than the Currencies module records. Typically these records are only updated when the record is saved either by a user or integration. We realize your financial data is sensitive and want to treat it carefully. There are several methods to handle updating records but a blanket approach would not work for all customers. Please contact us to discuss how we can help find the best solution to keep your records up to date.